That is correct as bad as that may sound. Campag 10s shifters and slam 10s rear der does indeed shift shimano(and spam) 10s spacing..yee-farging-gads!! Peter, that is just gross. You've been compromised by the Russians? Joking - but seriously, does this allow me to use Campy shifters with a big gear ratio? Plus, use any old wheel set I want because it is Shimano ? Yup, done it..it 'seems' to work best with Powershift 10s levers..Centaur and below, 2007/8..Haven't tried it with 2009+ 'Gumby' 10s shifters but I suspect it will. These shifters ARE also compatible with the long cage Campag rear ders also tho..Racing T, Comp, etc...BUT 10s Campag is closer to ctr cog to ctr cog to shimano 9s cogs than 10s(if ya do this, use a 9s chain).. But the Campag shifter->spam rear der gig was 'discovered' by Lennard Zinn..he brought a rig by(actually rode over) and let me look at it in the stand..freaky..kinda like dogs and cats living together..Twilight Zone stuff..
Strangely enough..I have used a Campag 10s front ders on 8 and 9s shimano rigs too..'QS' ones..
Last edited by oldpotatoe; 02-11-2019 at 07:24 AM. Anyone used a Specialties TA cassette? Looks like a custom job can get a 32 tooth big cog, but pricey. I had one back in the 9 speed era. They are beautifully machined and shift so well that you could barely tell that you weren't using a pure Campy setup. They wear well for alloy, but that means faster than a steel cog, obviously. I eventually wore out the 15,16, 17 t cogs. I still have the unworn cogs that I can use to make up a hybrid 12-25 with light alloy bigger cogs. Thinking back, I think every product that I have ever encountered from TA has been really good. Soooo, what frame is this? It has some pretty cool old brakes - love it!!! This thread has peaked my interest. I have my BMC set up with Jones bars and a 10 speed XT drive train. I'd love to go back to road bars, (Salsa Cow Chippers) and use an old set of Record 10 speed ergo levers to shift a Shimano 11-34 cassette. Will any SRAM 10 speed rear derailleur work? I'm looking at a SRAM GX 2x10 long cage RD. Will that work or should I look for a different SRAM model? Yes, I'm using the Exact Actuation (1:1) GX long cage with clutch with an XT 11-34 and Gen 1 Record 10 levers and it shifts well. Tuning took more patience, but when dialed it's solid. Others will chime in that it didn't work for them, no idea if that's from using the wrong derailleur or some other issue, but in my single experience it works. As horrid as that all sounds .... could be very useful for some kind of cheap and cheerful monstercross build. Found a SRAM rear derailleur, so I'm prepared to try this amalgamation. 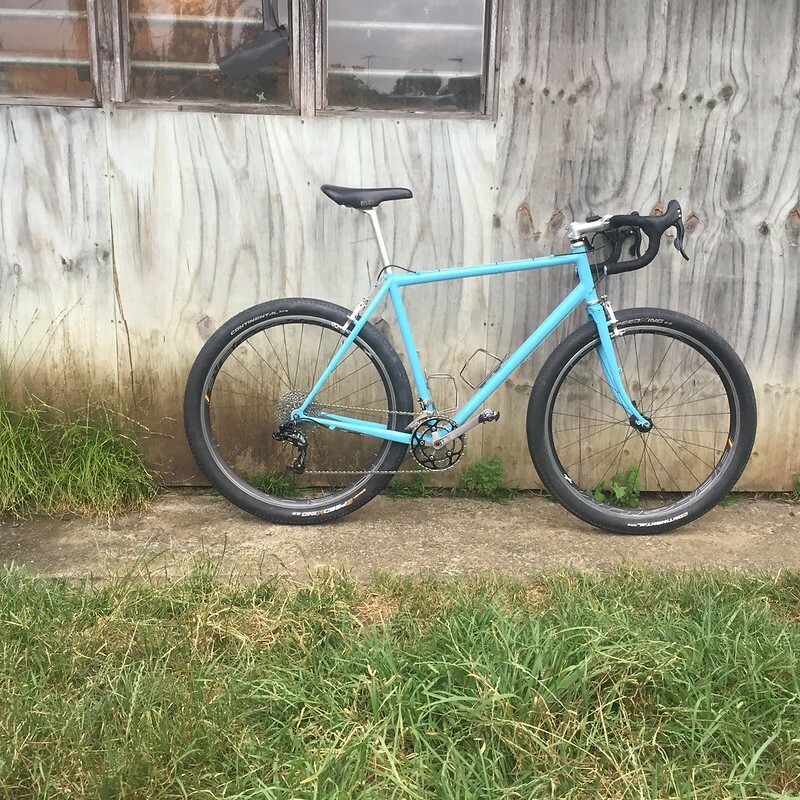 I'm trying to make this work with Chorus 10 speed shifters, a SRAM GX 10 long cage RD, and a Shimano 10 speed 11x34 cassette. My crank is a Shimano CX-70, 46x36, working with a similar Shimano FD. Any thoughts on the best chain to use or suggestions on how to make this work are appreciated. I used an 11-36 Shimano 1080 cassette with a JTek Shiftmate and a Chorus long cage derailleur. Worked perfectly. It needs more cable tension than the standard full-Campagnolo set up. I'd use a KMC, Shimano, or SRAM chain with a Shimano cassette. Also, I'd go the whole way and just use SRAM shifters with those derailleurs. But that's not the Paceline way. Ergo 10 with sram derailleur did not work well for me at all, while Shimergo 9 speed was.